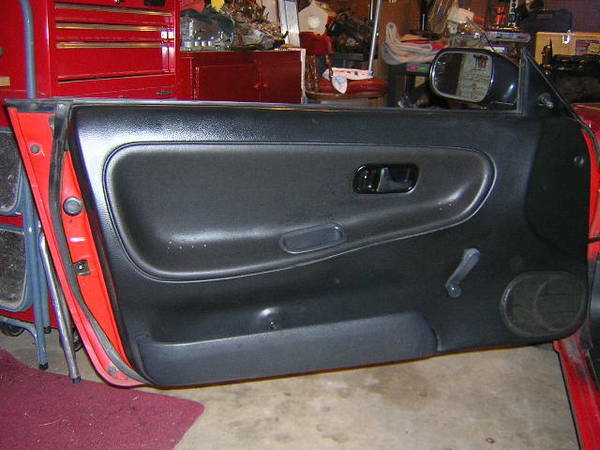 This DIY is to help you reupholster your door panels on an S13. I got sick of my door panels being rough and not comfy so I decided to try my hand at recovering them. I thought it turned out really well, much better than I expected. I love the material I picked out. It is almost a felt-like material and it is easily stretchable, which is very important for this DIY project. I bought 1.5 yard of this double over’d material at Wal-mart for $6 and a can of Elmer’s Spray Glue craft spray glue for $5. Time: 1 hour per door, but take your time! Start by removing the handle trim, the grab handle etc. Next, cut enough material for it to be draping over your door panel (it will be a lot easier if you do this instead of trying to hold it up while gluing). Start spraying glue in the middle of the door panel and continue to glue around the holes for the parts you must put back on. Smooth out the fabric and make sure there are no creases. Now, using the razor blade, cut a hole for the handle cover and put the handle back on (this will help keep the fabric in place). Now you are going to need the blow dryer/heat gun to heat up the material to make it more stretchy and easier to work with. After heating, glue the area with the large curve making sure there are no creases in the fabric (this was surprisingly easy with the material I used). Once all the fabric on the panel is glued down you can trim the fabric smaller so its easier to work with the edges. The next part can be sort of tricky. Do some fine trimming with the razor blade and leave about a centimeter of fabric from the crevice in the panel. You then tuck the fabric into the crevice while using a small amount of spray glue on the very edge. Continue tucking in the fabric around the entire panel. Once you are done with that, the door panel is ready to go!I love the finished product. This is my favorite DIY interior project so far.Using the same material, I also recovered my glove box, padded my armrest, and made shift and e-brake boots. It gives your interior a much classier look and feel.